One of Daseke's recent acquisitions, flatbed carrier TSH & Co., via Daseke Inc.
Daseke Inc. reported a first-quarter net loss of $800,000, or minus 4 cents per share, compared with a net loss of $7.7 million, or minus 32 cents per share, in the first quarter a year ago. The flatbed and specialized transportation carrier saw revenues jump more than 100%, to $327.6 million from $160.4 million in the first quarter of 2017. Addison, Texas-based Daseke said the improvement in revenues was due to seven acquisitions last year, in addition to improvement in rates in its flatbed and specialized segments. The flatbed unit saw its revenues rise 78%, to $145 million from $81.3 million. 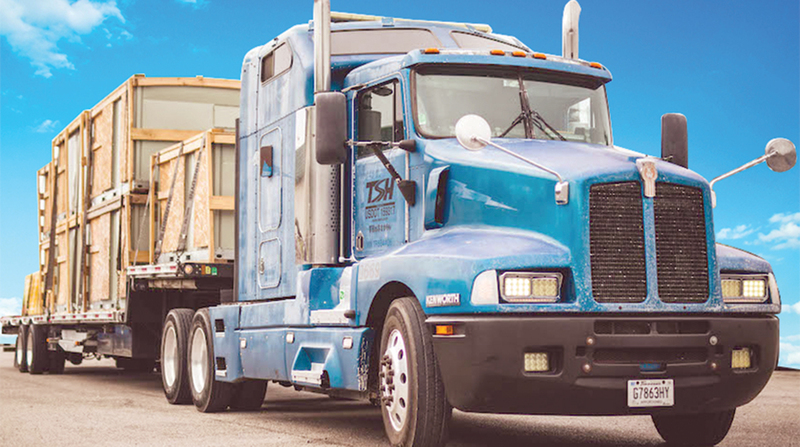 The increase was due to the purchase of TSH & Co. last December along with a 6% increase in flatbed rate per mile and 3% growth in revenue per truck. The unit’s operating income was $7 million, an 80% increase from $3.9 million. The specialized solutions unit reported revenues rose nearly 130%, to $184.9 million from $80.7 million. The jump was attributed to the acquisition of six firms in the past 12 months, along with a 5% increase in specialized rate per mile and 10% growth in revenue per truck. Operating income for specialized was $5.1 million, up more than 400% from $1 million. In a conference call with analysts, CEO Don Daseke said the company was focusing on operational improvements, driving its organic growth and improving synergies among its acquisitions. The company is looking to acquire more companies along the lines of its first-quarter purchase of Aveda Transportation and Energy Services, a North American oil rig moving company based in Calgary, Alberta. The deal is expected to close in June. Aveda’s oil service business also diversifies Daseke’s revenue stream in the energy sector that now is primarily in the wind-energy niche, Wheeler said. Daseke also is eyeing acquisitions in high-security cargo and opportunities that would expand its commercial glass business. Daseke provided its revenues broken down by major categories. Freight had revenues of $240 million, nearly doubling the $125.6 million in first-quarter 2017; brokerage revenues were $46.1 million, up from $20.8 million; the new category of logistics had revenues of $10.7 million; and fuel surcharge revenues more than doubled to $30.6 million from $14 million. The company operated 1,128 tractors at the end of the quarter, down 4.2% from 1,177 a year ago, while the number of owner-operated tractors jumped to 1,510 from 445. At quarter’s end Daseke had 4,536 trailers. Its trucks drove 51.4 million miles in the quarter, more than doubling the 24.6 million miles a year ago. Daseke purchased seven firms last year — Big Freight Systems, Moore Freight Services, Roadmaster Group, R&R Trucking Holdings, Schilli Transportation Services, The Steelman Cos. and TSH & Co.